No matter where you are on a Peninsula College campus, you are just steps away from experiencing unique works of art created by artists who are living and working in the Pacific Northwest. The latest additions to the collection, featuring 27 pieces by 18 artists, will be dedicated at 3:00 pm on Tuesday, April 30, in a public ceremony open to all who would like to join in celebrating this Art in Public Places Program offered by the State of Washington. These new pieces are installed in the Library, Keegan Hall and the new Allied Health and Early Childhood Education Center on the Port Angeles campus of Peninsula College, and can be viewed after the reception through self-guided tours. 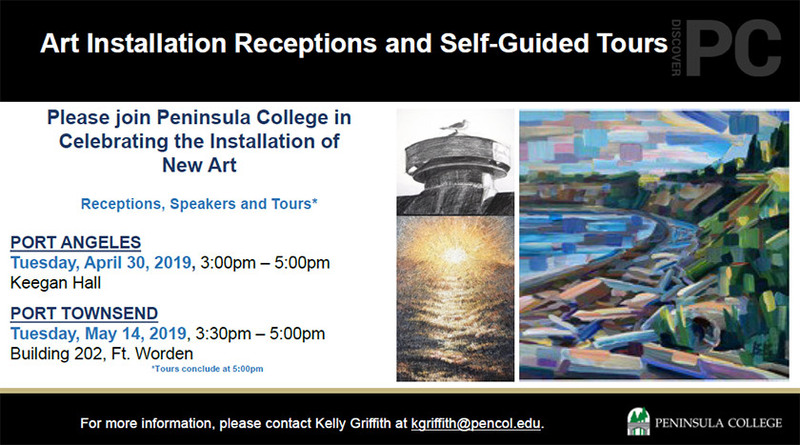 Peninsula College President, Dr. Luke Robins, will open the dedication ceremonies and will be joined by Chuck Zimmer, Project Manager for the Art in Public Places Program, and Kathleen Moles, Curator of this recent permanent collection. Dr. Janet Lucas, Interim Dean of Arts and Sciences at Peninsula College, will speak to three additional works created by Peninsula College art instructor and award-winning artist, Michael Paul Miller, purchased separately by a donor and gifted to the College in 2016. “This art represents a wide range of artistic styles and themes,” says President Robins. “We’re proud to have a permanent thought-provoking collection of fine art on campus that stimulates the cultural and learning environment for our students and the public. We hope that everyone takes the opportunity to see these works, and recognize the impact of the Art in Public Places Program, and how energizing it can be in the spaces where we study and work and meet together,” Dr. Robins says. The collection was selected by a committee of representatives from Peninsula College and the Washington State Arts Commission, and features new, emerging, and local Northwest artists whose work is diverse, inspiring and complex. “Our goal was to expand horizons and push boundaries, while providing interest, color and contrast to the beautiful facilities where the art is installed,” says Patty McCray-Roberts, Director of Facilities Planning and Operations. This collection was funded by the State of Washington’s Art in Public Places Program, which was established in 1974 by the Washington State Legislature. The intent was to set aside ½ of one percent of the state’s portion of construction costs of State-funded buildings to provide for the acquisition of art for K-12 public schools, colleges, universities, and state agencies. Peninsula College also has several other collections of art funded by the Art in Public Places program, such as the installation in Maier Hall and the sculptural water feature located on the common area behind the Pirate Union Building and near Keegan Hall.